Cox’s Wholesale Seafood, LLC is proud of its long tradition of processing premium domestic IQF shell-on and value-added shrimp and marketing their quality products to retail and foodservice markets across North America. Founded in 1978 in Tampa, Cox’s originally specialized in fresh, domestic wild-caught grouper, snapper and other fish along with Rock Shrimp and Florida Pink Shrimp harvested by their small fleet of boats. Cox’s main product is Florida Pink Shrimp, known for its sweet, tender meat. The company also buys wild caught shrimp from Texas up to the East Coast, all with an emphasis on catches that are 100 percent free of sulfites, phosphates and processing aids. “If there’s a shrimp boat unloaded anywhere in the Gulf, we have the capability of buying from that shrimp boat,” said David Cordy, Cox’s president, who has worked more than 40 years in the seafood industry. Today, 90 percent of the business is private label, he said. Cox’s sells 6 million to 7 million pounds of Florida Pink, White and Gulf Brown shrimp as well as domestic peeled and deveined shrimp a year. “We are increasing production and sales every year,” Cordy said. When the shrimp arrive at the Tampa plant, Cox’s food safety and quality assurance supervisors test samples for weight, size and any chemicals. “The majority of what we do here is chemical-free shrimp,” said Cordy. More quality checks are performed when products leave the plant. “We have a lot of checks in the system to make sure everything we do is right,” he said. This year, the company is launching a new line of sauced shrimp. “Our directive has always been to grow the business and make things happen,” said Cordy. Cox’s production workers make up the majority of the 85 person staff and many are longtime employees with 10, 20 or 30 years of service. The company credits them with keeping customers in mind and making sure the products are up to Cox’s highest standards. “Everybody in the plant is totally committed to quality, integrity and customer service. They are our stewards over what we ship to our customers and we encourage them to do that,” Mathews said. Cordy added that perfect attendance awards are plentiful at the annual company picnic. “We have good, conscientious workers and very little turnover. That tells you our employees like working here,” he said. Longevity can also be found in the sales department, where Mathews and the three salespeople have more than 100 years in the seafood business. 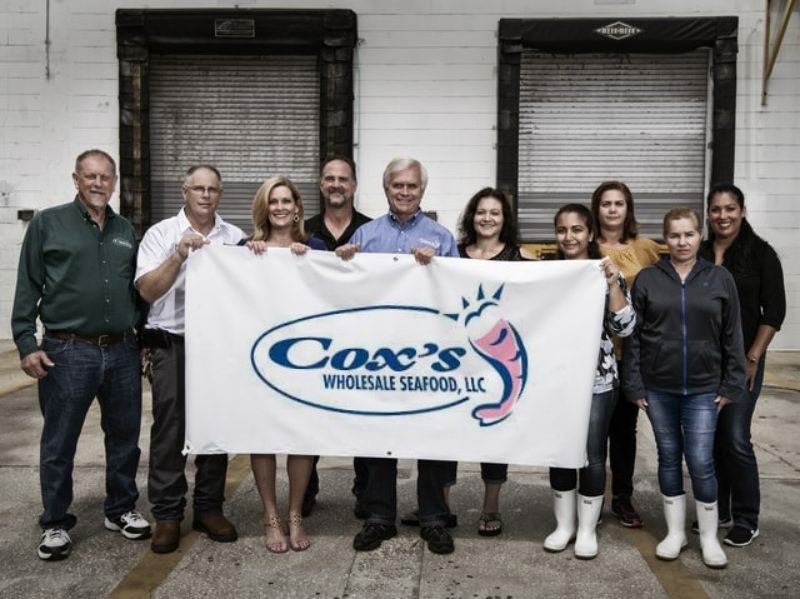 Cox’s Wholesale Seafood continues to be committed to the highest industry standards as well as the conservation and sustainability of Gulf and Atlantic shrimp. The plant is BRC Global Standards-qualified. “We are AA rated, which is the highest you can get. We’re very proud of that,” said Mathews. Customers expect and appreciate such commitment to quality. “They want to know that the company that is packaging their brand has the highest food safety rating. It helps them sleep at night,” she said. The company supports all efforts to ban trawling in protected areas where juvenile Key West Pink shrimp live and works closely with the trade associations that established the 3 million-acre Pink Shrimp sanctuary. Sustainable Fisheries Partnership and Cox’s have collaborated on the Fishery Improvement Projects (FIP) for Key West Pink Shrimp and Texas Gulf Shrimp to support the sustainability of the species Cox’s procures for customers. Cox’s is also a member of Ocean Trust, which focuses on habitat restoration and marine conservation, and National Fisheries Institute, which partners with Ocean Trust and other conservation initiatives. And it partners with Trace Register and Gulf Seafood Trace which tracks the origin of domestic seafood.